This working ranch offers top quality mules for sale, riding instruction & clinics, & boarding. Coyote Mule Ranch is the place to find the right mule (or mules), tack and instruction to get you riding or driving and having fun! We are Barney and Bobbi Jo Chambers. Learn more about us, our background and experience and why we are qualified mule experts. We ride, train, and sell mules year around. Not only do we have mules for sale, but we also offer individual or group instruction for a long safe relationship with our equine freinds. Riding in the mountains, show ring, packing or driving we we want and enjoy helping. ONE STOP SHOP to do it right! We offer: Many types of used quality tack to fit you and your mule. Bridles, saddles, bits, pack saddles, – we have got ya covered for riding. We even have some used quality horse trailers around from time to time! Wagons, forecarts, and working implements plus a huge selection of harness for driving. Coyote Mule Ranch is on location of the original Tacke Farm, homesteaded in the early 1900’s. We have completely restored the original barn and created a large indoor arena with an amazing cathedral roof. A 20 X 60 foot tack room and tie stalls can offer a western heritage feel you can not find. The barn also has a working office with high speed internet, wifi, and restrooms. Believe it or not you will feel right at home in our barn anytime of the year. The view from the ranch is spacious and grand, we overlook the Camas Prairie and are backed by the Salmon River Breaks in North Central Idaho. We are a 3.5 hour drive south from Spokane or Coure d Alene – 4 hours from Missoula Montana or 4 hours from Boise Idaho. Our ranch has easy main road access as we are only 1.5 miles off of Hwy 95. The nearest main Airport is Lewiston Idaho just 60 miles away. Located in North Central Idaho, Coyote Mule Ranch overlooks the vast Camas Prairie, the foothills of the Northern Rockies and Selway Bitterroot Wilderness and in the midst our ranch is backed by the Salmon River Breaks. The ranch is an original homestead founded in the early 1900’s. 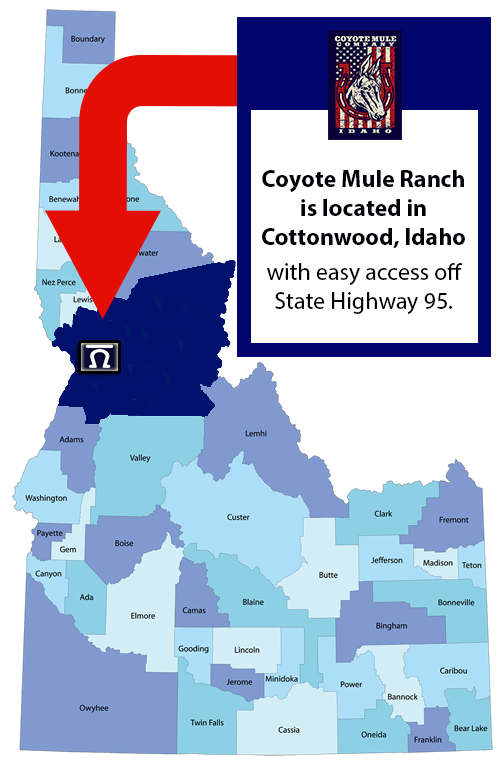 People from all over the U.S. come to the Coyote Mule Ranch to enjoy a taste of Idaho’s old west.